Kobo is releasing a new premium e-reader and I have one (excited) word to say: BUTTONS!!!! The Kobo Forma, (Kobo’s answer to the Kindle Oasis) takes blends features of the Kobo Aura One with some of the popular features from Amazon’s high-end e-reader. The new Kobo Forma features an eight inch display, which is larger than both the Aura One (7.8 inches) and the Kindle Oasis (7 inches). Like the Aura One, the Forma is IPX8 rated and is immersible up to 60 minutes in 2 meters of fresh water. At 197 grams, the Kobo Forma is lighter than both the Kobo Aura One and the Kindle Oasis. 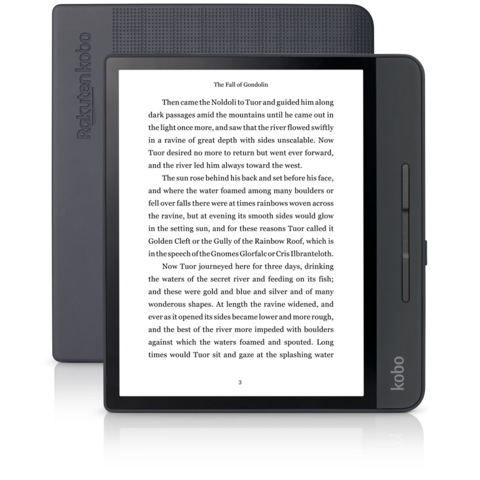 The Kobo Forma and the Aura One both feature Kobo’s ComfortLight PRO lighting which reduces blue-light exposure for the best nighttime reading. The Kindle Oasis, on the other hand, has an adjustable light sensor, but does not reduce blue light. There are a couple of important features that differentiate the Kobo Forma from other devices in the Kobo lineup. The Forma has added physical page turn buttons. The back of the Forma is flat and, instead, the buttons are placed on an angled section that is slightly thicker than the rest of the device. The new hardware also features a gyro so the device can be used either right or left handed as well as in landscape and portrait modes. There is an interesting Kobo sleep cover for the Forma. The design is Similar to the original Origami covers Amazon offered for some of their e-readers and Fire tablets. The Forma sleep cover is priced at $49.99. The Kobo Forma has 8 GB of storage. The 32 Gb version of the device will only initially be availabe in Japan, with other countries to follow at a later, unspecified date. Price for the Forma is $279.99, which is $50 more than the Aura One’s $229.99 price tag. The Kobo Forma is available for pre-order now and will be released on October 23, 2018. You can find the complete specs here. Mostly, I use my Kobo Aura One for library books (some books are only available in an epub format and can’t be borrowed on the Kindle). I also buy books on sale through the Google Play store which require Adobe Digital editions to download. Since I bought my Oasis, trying to read on the Kobo Aura One has been harder for me because I really, really miss the page turn buttons. Personally, I am going to be watching the reviews on this one carefully. I am thinking that it may be a good candidate for a backup eInk reader. This entry was posted in eReaders and tagged buttons, e-reader, Forma, Kobo. Bookmark the permalink.